Digital technology introduced even non-mathematicians and engineers to the term, binary. Ones or zeroes. On or off. In 1987 Jeremy Rifkin wrote a book entitled Time Wars. He observed the difference in digital watches and analog, and the impact they have in our sense of time. It’s bigger than that though. It speaks to the black and white nature of digital versus the various shades of gray apparent in the analog domain. Look at any traditional clock with an hour, minute and second hand and you have some sense of not just the current time, but the past and the future time. Now, stare down at your cell phone – which likely serves as your daily time piece. You can see what time it is. The current time. That’s it. Just the current time and nothing more. Unfortunately, executives can be prone to approach leadership in the same way. Black and white, absent of any shades of gray. The reality is our organizations and our leadership is realistically filled with gray. If we refuse or fail to see it, acknowledge it and lead comfortably in the gray then we’ll fail to be the evidence-based leaders capable of propelling our organizations higher. Sadly, that’s how some leaders lead. One size force fits all. They are the way they are and it’s incumbent on the troops to adjust. Black or white. Those are the only options. You either please them or you don’t. And in most cases, even if you please them…it won’t last. You’ll eventually find yourself in their doghouse because everybody does. Employees, for these leaders, are just part of the big bag of nails that vex their daily life. I bring this up because I’ve observed that shades of gray encompass lots of facets of leadership. It’s not just how leaders view things, but it’s how they choose to respond to thing. People. Situations. Circumstances. Opportunities. Leaders with an elevated ability to embrace the gray have learned to adapt to what they believe is most warranted at the time. Sometimes it requires a stylistic change. Watch a leader hold forth with a small group of upper executives and pay attention to the language, the body language and the candor. Then watch that same leader deliver the message to the troops and it’s a different performance because the stage and the audience require it. Great leaders recognize their responsibility to provide the right fit at the right time. That’s a big part of seeing and managing the gray. Embracing the gray isn’t merely stylistic though. Problem solving is another area where effective leaders understand the benefits of seeing the gray. Some of the better solutions are born from investigating possibilities we may not initially gravitate toward. Embracing the gray is refraining from drawing a quick conclusion until you have sufficient evidence. Warning: It can be much tougher than it sounds. Know if you’re a hammer. Or any other tool that can’t perform multiple tasks. Leaders who embrace the gray have learned to be Swiss Army knives in assessing and problem-solving. Sometimes you need a screwdriver. Other times you need pliers. It’s requires training yourself to be patient, open-minded and receptive to possibilities or ideas. Patience. Silence. Contemplation. Investigation. Verification. These are a few of the things you need so you can embrace the gray. The goal isn’t to brag about how into the gray you can be…it’s about being smarter, wiser and making better decisions. It’s about drawing the correct conclusion while avoiding the knee-jerk reaction (and getting it wrong). Not because you’re afraid of being wrong, but because getting it right best serves your people and organization. “He wears his idealism on his sleeve and it makes him very judgmental,” says an executive. He’s talking about a direct report, Bernard. He goes on to talk about all the times that this mid-level manager has created problems because he refuses to see any gray. Bernard sees right or wrong, good or evil, crooked or straight. No middle ground. Ever. The boss is vexed and almost out of his mind in what to do. The boss describes Bernard as a guy with such a high degree of self-righteousness that people now don’t want to work with Bernard. The boss has only tolerated it because Bernard’s work is top-notch. But these people issues are now beginning to have a crippling effect. The boss is looking for input on what might be done to help Bernard. I want to offer the boss some hope, but the big challenge is whether or not the organization wants to devote the time, energy, money and effort into Bernard. It might not be the wisest use of resources if the boss has spent considerable time (years) attempting to coach Bernard to see the possibility of gray. These aren’t decisions I make – not any more. Not as a coach or consultant. My job is to serve the leader who hires me, but I’m not prone to urge any investment in a lost cause. I tell the executive that it sounds like he already knows what he needs to do after spending years doing everything he could to help Bernard “see things differently.” Altering how people see the world – and others – is a very hard thing when you’re Bernard. It’s just how Bernard sees things. All things. All the time. Besides, Bernard has proven resistant to change, even in the face of constant coaching from his boss. Such binary behavior foils the career progress of high performers like Bernard. He’s shooting himself in the head without even knowing it. Bernard suffers a common type of binary behavior. He has standards of ethical behavior that few others seem to match. Bernard is harsh in his judgment of others. The slightest deviation from what he thinks is proper is viewed as a low integrity action. Bernard just can’t seem to bring himself to the possibility that people just don’t always share his knowledge, convictions or world view. People in Bernard’s world are either right or wrong. No middle ground. Ever. You can see how such behavior would grow increasingly problematic for Bernard’s boss and co-workers. Strife and tension kept escalating. Bernard thought he was always right. The problem was everybody else. Repeated efforts to help Bernard see gray failed. Ultimately, Bernard was given a binary choice: resign or be fired. A key to embracing the gray is to acknowledge our ignorance. It can start with the mere confession that we might be ignorant about some things. If you can start with the sheer possibility of ignorance, then you can migrate to the reality. Sadly, people with a binary point of view refuse to even consider the possibility that they’re wrong about anything. You need to learn and grow if you want to become a great leader. That can’t happen if you think you already know everything. You can be right much of the time – maybe even most of the time – but you’re not right all the time. The sooner you willingly acknowledge that with your team, the better. But the head trash of “I’m the boss; I have to always be right” can clutter things up nicely. Cliches fill our heads with notions that leadership demands an appearance of superiority. Never let ’em see you sweat. Never apologize. It’s a sign of weakness. There are too many of these idiotic “truisms.” In preparation for episode 280 – the one I’ve been promising about evidence-based leadership – we need to get our leadership tiller out and break up the hard, dry ground of ignorance. If we don’t, then the seeds of evidence-based leadership won’t be able to take root. 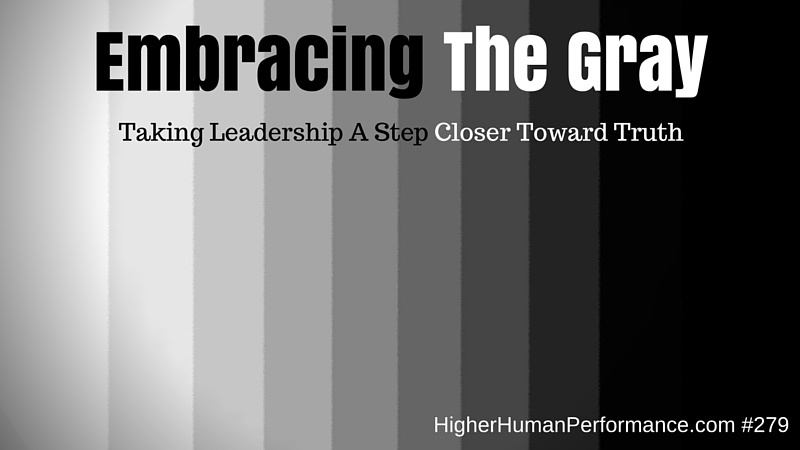 Must I convince you that embracing a gray scale in your leadership will benefit you and your team? I can do that, but only if you value the truth, accuracy and making a positive difference in your organization. Reason #1: Competence – your own and the competence of your team – hinges on it. Competence is defined as the ability to do something successfully or efficiently. Of course you want that. Yes, you want it in your people, too. We don’t come to work every day trying to fail. Nobody does. Everybody wants to feel that they’re making a positive difference. We all need to feel valued. That’s best accomplished with our performance. Bernard proves that we also need to get along and have a reasonable degree of likeability, but if our work product is poor…nothing else matters. Competence encompasses our skill (maybe even our natural aptitude), our opportunities and our ability to seize those opportunities. If your leadership is binary, devoid of seeing shades of gray, then you’re not able to see skills or opportunities as clearly as you should. The blinders that help you focus only on black or white prevent you from seeing other things. That lack of vision stops you from seeing the possibilities in yourself and your people. When I was in my 20’s I was running a relatively new start up retailing company, a consumer electronics outfit. I was an experienced commissioned sales guy and merchandiser. With almost a decade of experience I found myself needing salespeople who were comfortable with a commission-based compensation program AND who were comfortable educating shoppers in things unfamiliar to them. Technology was moving fast and home video was beginning to take off. The VCR was less than 10 years old and now portable video recording was available. Additionally, stereo TV and stereo VCR’s were hitting the market. Big screen TV’s were also gaining strength. But all these things were unfamiliar to most homes in America at the time. I needed salespeople capable of making these technologies more easily understood. Where could I find salespeople capable of this? A binary approach would be to find experienced consumer electronics people, but I had a third consideration (in addition to commission-based compensation and capable of educating shoppers). I wanted people fanatical about customer experience and service. I already had experience with people who had worked for other consumer electronics outfits and most of them had bad habits that demanded fixing. I was ready to do something more positive. I embraced my own level of gray. The bedding industry was experiencing a new trend. Maybe it was a fad, but it was something so completely different than the traditional mattress it required some salesmanship qualities I sought. Waterbed stores were popping up all over the place. I went to a few of them to see how the salespeople would sell me a waterbed. I quickly learned they were paid a commission. I also learned they had to explain things most shoppers had no experience with – I’d never slept on a waterbed. I didn’t know how they even worked. And like every sales field – some were very attentive to shoppers and others were apathetic, but I saw what I thought was a disproportionate number of excited, enthusiastic salespeople. So I recruited a few. They had no consumer electronics background. Instead of breaking bad habits we had to teach them the terms and technology of the products we sold, but that’s a very different activity than correcting bad habits. It was positive all the way around. Brought about because we refused to be binary in our approach to building the business. Our competence as leaders and the competence of our sales team rose because we realized there might be a better solution to our people problem. It’s not always about seeing if a round peg might fit into a square hole. It’s really about opening your mind to look for patterns that might fit the problem you’re trying to solve. Sometimes the dots don’t connect from point A to point B without going through points C and D. Having that flexibility will propel competence forward. Reason #2: It’s attractive to your team. Nobody finds the knee-jerk leader attractive. Even the knee-jerk reactors on your team don’t appreciate that trait in YOU, or any leader. Talk to impulsive, emotional people and they’ll tell you they appreciate a leader who is deliberate, intentional and purposeful, but who also takes the time to “get it right.” People don’t want to follow leaders whose decisions aren’t impacted by more information – especially when they’re the ones trying to provide that added intelligence. Think about the times you tried to present additional information to your boss, but felt it wasn’t given any consideration. How did that make YOU feel? People don’t enjoy that feeling. Instead, they want to give information that is being given some consideration. It fosters them to provide more information. I know what you’re saying, “I don’t care about being attractive to my people.” Tap the brakes on that thought. You should care. Every salesperson learns that people buy from friends – or people who are friendly. It’s that trite “know, like and trust” model. Trite, but true. Your leadership is greatly impacted by your ability to influence the people in your organization. Be unattractive and see how influential you are, or how persuasive you are. Flies and honey and all that. Stop resisting it. Stop telling yourself that it doesn’t matter. It does matter. A lot. Your attractiveness is greatly determined by your willingness to see and appreciate shades of gray. Those shades are often provided by input from your team. Try something for me. Make a decision before you gather information from your team. Just figure out what you want to do, then have a meeting with your team. In that meeting give them the problem. Tell them this is why you’ve called the meeting so you can discuss the problem. Then tell them, “But I’ve already decided what I want to do and nothing you say is going to change my mind.” Now, shut up and watch the room. See how every single person shuts down. Binary leadership shuts people down. It shuts down their attraction to leaders. And leaders without followers or supporters are just lone wolves waiting to get killed in the wild. Reason #3: Embracing gray will foster your own personal growth and the growth of your entire team. It won’t guarantee it, but it will foster it. I’ll go you one better – if you remain a binary leader you won’t grow and neither will your team. You must embrace the gray in order to grow even though embracing it won’t solely guarantee it. It’s just one – albeit a very important – part of the equation. You only know what you know. The hard thing is to figure out what you don’t know, or to open yourself up to the prospect of what you don’t know. That’s easier to do with specific skills. It’s much harder when it’s leadership. Do you know how to speak Spanish? Can you write php code? Do you know how to install a tile back splash? These are specific skills that you either know or you don’t. You instantly were able to give a binary answer to those questions. Yes or no. Sure, maybe your ability or inability to do any of those things has a range of competence, but you have a pretty clear idea of your proficiency. Maybe you can understand a little bit of Spanish, but you can’t speak it or write it. You have a realistic view of your Spanish deficiency. Leadership doesn’t work like that. It’s like communication and other soft skills. That also makes it prone to delusion. We can think we’re better at it than we really are because there’s no binary measurement – like speaking Spanish, or coding php or installing tile. If you want to learn any of those skills you’ll figure out what to do. It begins with your desire to learn something you don’t yet know how to do. Or it begins with your desire to get better at it. Learning presupposes some degree of willingness to know, or a willingness to know more. Can you lead? Can you communicate? You likely said, “Yes.” You gave a binary answer. And I’m betting you gave an affirmative answer. Even non-leaders often tell me they know how. The poorest communicators tell me they’re pretty good at it. And this is where the truly great leaders tower above the rest — they’re busy working to get better. They’re anxious to figure out what they may not know. They want to discover the gaps in their knowledge or skill that they may not even yet recognize. Great leaders are driven by what they may not have yet figured out because they know those may be the very things preventing them from being their best. Think about it. You’re the leader. Your organization or team mirrors you. You set the tone and culture for your team. In most cases, your people will behave like you do. They’ll repeat the stories you tell. They’ll talk like you do. They’ll think like you do. You may not recognize it, but I promise you the signs are evident. Your resistance to embrace gray will become their resistance, too. Because you’re the boss, you have an impact. Some of your influence is simply because you have the power and authority, not because you have their respect. Don’t fight it or squander it. Use it to the benefit of your organization, your leadership and your people. Growth and improvement are the goals. Don’t urge your people to improve without showing them of your commitment to it your own work. Get better all the time and let people in on it. Confess or admit the weaknesses you’re trying to shore up. Don’t stoically go about your business in a binary way if you want to become a more effective leader. Embrace the gray so you can give yourself and your team the opportunity to keep growing. I’ll tease you a bit for the next episode. Getting closer to truth – in any area – will make you more effective. That’s the whole point of evidence-based leadership…to move you closer to the truth. Why? So you can make the best decisions possible. I continue to preach the message of your role as a leader: to solve problems and to make the best decisions possible. But there is another aspect to your leadership: to help your team do their very best work. Together, those 3 things are the legs of the stool upon which your career is built. Quite a few leaders (a ‘hem “managers”) neglect getting to the truth in these areas. It hampers their leadership. As a result, their solutions aren’t as good as they should be. Their decisions aren’t either. Even stellar execution of a poor plan has poor results! The problems facing you right now deserve the best solutions possible. Hole up in your office. Accept no input from others. Think it through all by yourself and approach a solution like you would a coin flip. Heads or tails? Binary. Your only choice is THIS or THAT. There is no option for ANOTHER. Question: What if you could have more information? Ameriquest Mortgage created some clever TV spots that fully illustrate how horrible it can be to draw the wrong conclusion. Ironically, in 2007 Ameriquest shut down because of unscrupulous lending practices. They were a major player in the subprime mortgage crisis. See, things aren’t always what they seem.